Shipping Mail will be a flat 4.95 total for as many loose MMs as youd like as long as you are in the US. Outstanding movie, truly a cinematic tour-de-force. I have to be perfectly honest and upfront before I review this movie. I know that I am going to be slammed about this, but I am not a fan of the original movies. I loved the concept, but even as a kid I could see the faults in the way the movies were originally presented. 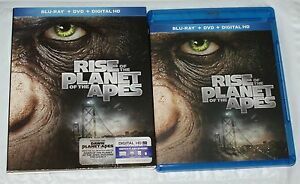 With the advances in technology since the originals were released, we are finally at a time and place where the true potential of great stories like The Planet of the Apes can be unleashed. A good friend of mine has Alzheimer's and seeing the way in which the apes evolved was both uplifting and awe-inspiring. The most amusing thing I noticed (and this may be purely co-incidental) was the fact that Congress passed a law restricting the practice of testing drugs on chimpanzees around the time this movie was released. Makes you wonder if they know something we don't or if they are all so incredibly stupid that they all saw the movie and think it is real. I never watched the Planet of the Apes movies before, they just never interested me. I was a little skeptical about buying it thinking it was going to be like the other movies. I am so glad I bought it! This was a VERY GREAT movie! It is the kind of movie that keeps you interested from beginning to end! I would highly recommend this movie to everyone. There are not too many movies out there where I can sit and watch the whole thing without getting up and missing bits and pieces. But with this one, I never got up once! I LOVED ALL OF THESE MOVIES. SO TO SEE THEM ALL OVER AGAIN WAS AWESOME.